I got this idea from a really neat book- Tangle Art and Drawing Games. My bloggy friend Jeanette (who blogs over at Craftwack) is the author of this seriously fun kids art book. She sent me a copy to review and my son and I went to town with it. :) The activities are so incredibly kid friendly. They're easy to do, super fun, and require very little set-up (which is a must nowadays!) So if you're looking for some easy ways to encourage creativity at home, definitely check this book out. 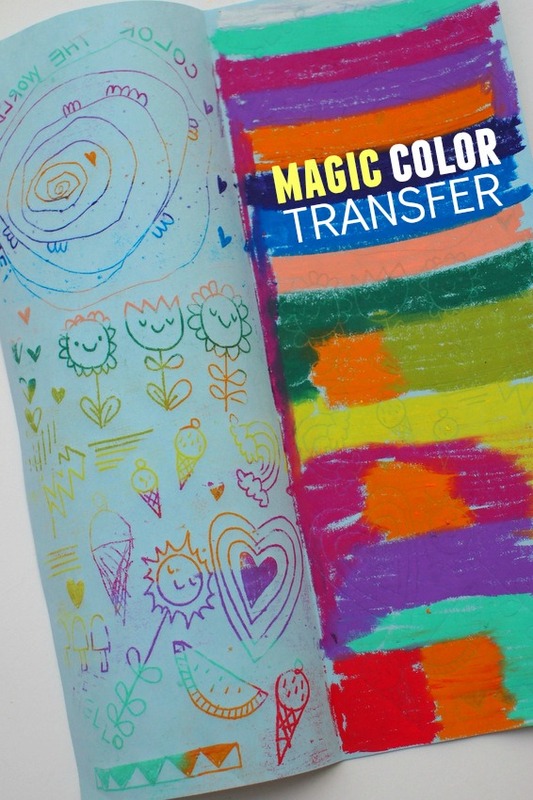 And now... are you ready to make some MAGIC color transfer art? Ok! Here's what you have to do. Grab a sheet of regular paper. Fold it in half vertically. Color one half with crayons (really, really hard) or just use oil pastels. Make sure to fill in every nook and cranny with color! Then, fold your paper back in half. Press hard and draw a design! Then, open your paper to reveal your design... in multi-color! Tada! Isn't that neat? The activity was so easy to do, we did the activity together while the baby napped. So definitely check out Jeanette's Tangle Art and Drawing Games for this activity and others!